My favorite day of the week used to be Thursdays for the sole reason that Friends was on TV. When the show wrapped up after 10 seasons, I was devastated and didn't think I would ever find another show to replace the void left by the end of the most fantastic show on television ever. Although no shows truly compare to Friends, over time, I have managed to acquire several different "must see" shows, most of which fall on Tuesdays. For the past month, my shows have been on hiatus, so I haven't had to worry about managing my time to incorporate eight hour work days, TV shows, track workouts, cooking, and other things. Tonight, however, most of my shows came back on - Glee, The New Girl, and Body of Proof (it was even more complicated when Dancing with the Stars was on). 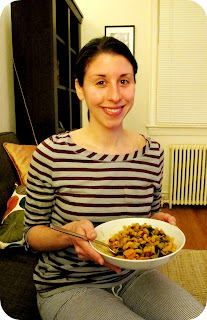 So, I got home as quickly as possible, ran my track workout, got home in time to turn on Glee, prepare and make a delicious minestrone soup (I highly recommend testing out this recipe! ), shower, watch the New Girl, and Body of Proof. That's some serious time management for you folks, and I am one hot potato (that's what you get when you cross a runner with a couch potato ;-)).